Hello and welcome to the latest and last instalment of this series. In the previous two parts we’ve looked at what are the key traits of a fantasista and how it can be interpreted as well as translated into FM. Here are the previous two parts if you haven’t had a chance to go through them: Part One and Part Two. To briefly sum up the essence of this project, my aim was to try and recreate a role that has perhaps faded away from the modern football vocabulary – the role of the creative forward that can defy the traditional confines of the game and offer that little bit of magic that turns the game in his side’s favour. Part one covers a few important aspects – why the fantasista isn’t the same as a ‘false nine’ or a ‘second striker’ for example, or in short… what are the traits that make up to define its’ style. In part two we’ve looked at Luan and Gremio as an experiment. We’ve covered how important it is that the overall design of the tactical set-up benefits from a fantasista and how to make the best use of his qualities. Unfortunately all my saves from before a couple of months back vanished and I don’t have the luxury to show the screens but Luan finished as the top scorer/top assist holder in the Brazilian top division as well as holding the record for the most key passes executed in the league. Whilst the style of play/movement these would help create would definitely ease the implementation of this role into FM, I wanted to show that different types of players can perform the fantasista role differently just as much as Del Piero was a different kind of fantasista from Totti or Baggio. At the end of the day what you want him to do is … well… ‘the magic’. Now I’ve chosen a bit of a challenge for this part. Having looked through Ajax’s roster I just couldn’t resist managing that squad full of young talent that just recently made the headlines by getting to the Europa League final. 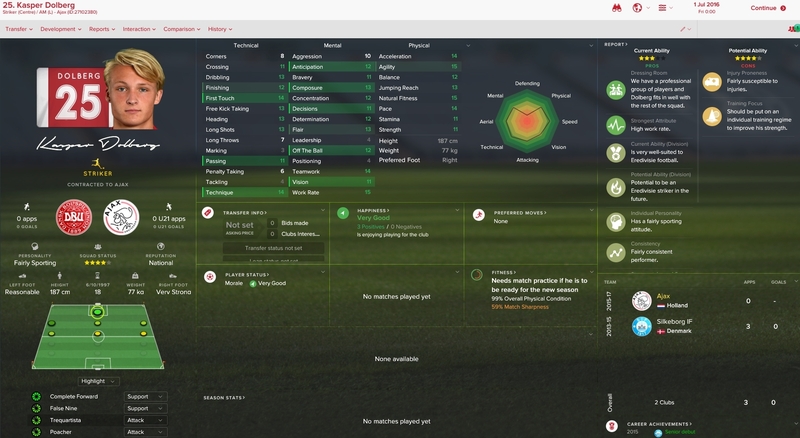 Plus… what better candidate for the ‘fantasista’ role can I possibly ask for than a young, talented and ‘open to moulding’ Kasper Dolberg? A fantastic talent, no doubt, and with bags of potential as well. His attribute spread is well rounded and offers us an interesting mix of physique & intelligence and technique. Afterall… core elements of the whole Ajax football philosophy. Still, un-impressed by his personality I brought in Didier Drogba on a free to help tutor Kasper and increase some of his mental attributes as well as change the ‘fairly sporting’ personality, which isn’t really the best you can get. The result? Perhaps less great is the fact that he’s also managed to ‘inherit’ a PPM from Drogba that isn’t really what I had hoped for: runs with ball through centre. Still, this only adds to the challenge that I have set out initially – different players with different styles of play can still perform the fantasista role in their own style. Over to the system now – I’ve recently covered a 3-2-2-2-1 with Gladbach that focused on the half-spaces and exploiting them through mobility & intelligent play. On a second glance, Ajax have the perfect squad for that system and a fantasista could add some interesting dimensions to its’s style. Now initially I used a ‘defensive forward’ for the striker role in that system – a role that hassles the opposition backline when not in possession and a pivot that holds up the ball and looks to support play when in possession. In the same line of thought, the previous task could be performed much, much better by a fantasista. As for the first… well, the complete opposite – I can’t expect a fantasista to run miles and hunt the opposition aggressively for the ball. Still, the benefit of having a much more creative role performing a task that has creativity as the main requirement could definitely outweigh the loss of ‘aggressive forward pressing’. Straight away, what jumps on the eye is the number of attacking duties present in the final third. Now there are a number of ‘influential’ guides out there to help you create a tactic and most of them would classify this as illogical. Why? The legend says you need a good ratio of support/attack duties in order to have a balanced system with players that connect in their movement and technical feats. This is sound as a basic principle, however, this system shows one particular dimension that I’ve always though to be a bit of a nuanced one, or at least tough to classify as ‘fundamental truth’ or you know… ’10 things you need to do in Football Manager’ kind of thing. The connectivity of the players on the pitch isn’t always about support/attack/defend duties. What matters is how each role with its’ given instructions/duty and in conjuction with the overall instructions of the system makes him behave in relations to the others around him. So what would that mean in our scenario? It means that the front three (Treq + SS + AM) are each performing duties that complement each other and that result in constructive/creative movement upfront with an increased level of urgency. Part of the reason why I chose all of the roles on attack duty is because the very formation we employ guarantees a high number of bodies in the midfield strata, which already helps us maintain good pressure on the opposition for winning back possession as well as the numbers to circulate and retain the ball in midfield. Same would go for the defensive side of our style: the most problematic area we can face (the wing) is well covered by the pressing triangles formed by the side CB’s, one of the DM’s and the respective WM on the same side of the pitch. For more detail, have a look at the above link on the Gladbach System, where I explain the ins and outs of the system in more detail. Finally, the only aspect of our style that could be problematic would be not having enough incisive intent in the final third. the fantasista (treq) looks to hold up the ball and spray an important finall ball for the on-running options. The yellow lines outline the offensive passing options Dolberg can perform providing he can make use of his balance + vision + passing in order to execute a turn & pass. There are four potential openings that can be on the receiving end: SS, AM & the WM’s. The two blue lines show the ‘safe route’ in case Dolberg is pressured by the opposition to the extent where he can not turn/pass. This duty of holding up the ball, spotting the opening and providing the final ball is a task the trequartista is much better equipped to perform compared to the previous role of the defensive forward. given that the Trequartista is a playmaking role, in current FM dynamics, that means that he will attract the ball and team-mates will look to him as the main source of creativity upfront. We only have two playmaker roles in this system: the DLP, responsible for organising and creating play from deep and the Trequartista/Fantasista himself. This makes attacking build up much easier, because the Trequartista is a role that makes himself available for a pass almost every time. This comes at the cost of him denying his defensive duties, but that is why this role is so special: when the team is defending / in the process of winning back the ball, the Trequartista will ignore that and instead look to find the best possible position to receive a pass and break play forward. Pure fantasista style. This is why you will find him lingering on the touchline at times, upfront, near the last man or deep down in midfield – he is simply roaming around assessing the situation on the pitch according to his own tactical intelligence (why mentals are so important for the role!) 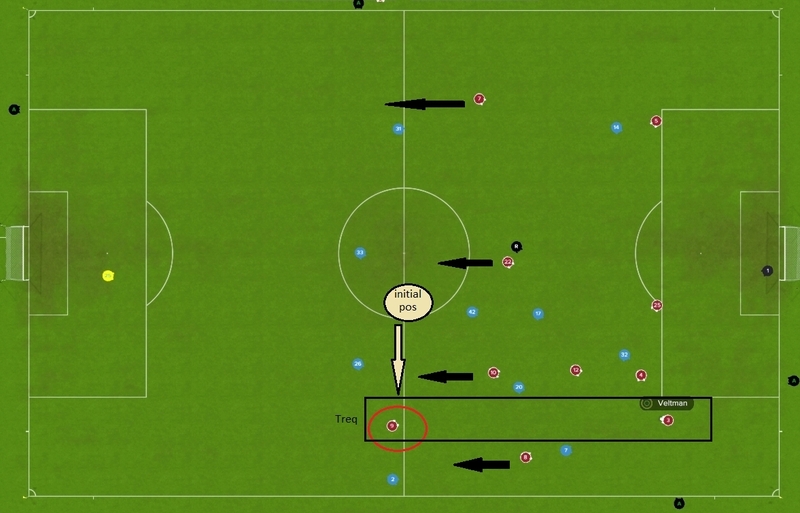 and finding the best position to receive a pass and create an attack from it. On a last note, I mentioned before that the fantasista is different from a false nine or a withdrawn striker. He is much more aggressive (risk-wise) with the ball compared to a false nine – he will look to attack the goal just as much as supporting his team-mates, if not more. Compare to the withdrawn striker, the fantasista does not have a ‘fixed’ position behind a specific player and does not rely on him to create space for him. As mentioned before, you will see him be far up the pitch at times, as high up as a poacher, and as deep in midfield as a CM at other times. Of course, there are hundreds of systems employing various styles of fantasistas, some even behind two strikers, but I’m trying to get as close as possible to the ideal definition of the role that I have in my head. On this note, the trequartista in the striker role is still a role on an ‘attacking’ duty, and his charge in the final third is much more aggressive compared to a false nine or a DLF. Here is an example of how the fantasista helps us create space for the other attacking options in the team: the play is focused on the right wing in this very instance, with our RWM looking to initiate an attack from the wing. Whilst the situation unfolds, our fantasista drags with him four opposition players, as he is the only striker we have, as well as our primary creator – so definitely danger no.1 for the opposition. This in turn, leaves our shadow striker with an incredible amount of space to receive the ball, assess the situation and take a decision. Finally, the way that the Trequartista always move around into ‘pockets of space’, looking to stamp his mark on the game make him perfect for the style of play I am (was) trying to achieve in this system. As mentioned before, it’s quite the mistake to start building a system for the sake of one player or trying to chop and change too much just to make sure you can exploit a specific player. The ideal situation is when the role/qualities of the player and the objective of the system are mutually beneficial. So for a system that seeks to exploit the half-spaces with intelligent movement and creativity as well as have enough attacking dent in the final third, the way Dolberg interprets the role make him a perfect fit for us. As for his ‘fantasista’ responsibilities…. Already a club legend, alongst the likes of Cruijff and Van Basten, he helped us win three consecutive Champions League titles (2018, 19, 20) and absolutely rocked the Eredivisie in each and every season, perhaps with a slight drop in form in the last, for which he was injured 6 months. 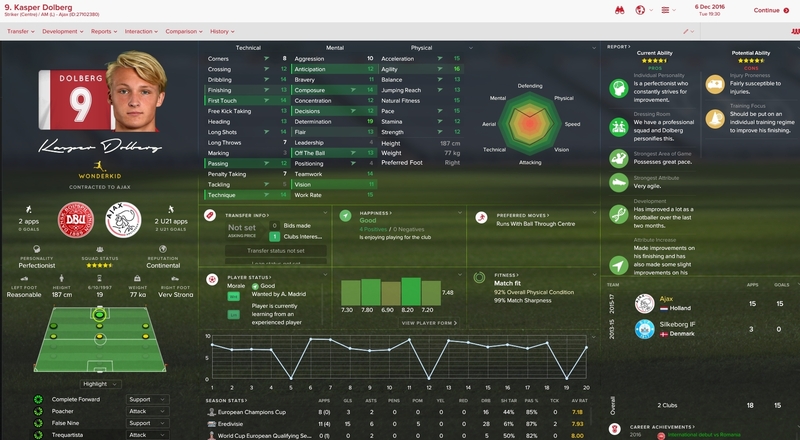 With 93 goals and 43 assists in 105 league appearances to date, I believe we’ve successfully converted King Dolberg into an effective fantasista of the modern game. 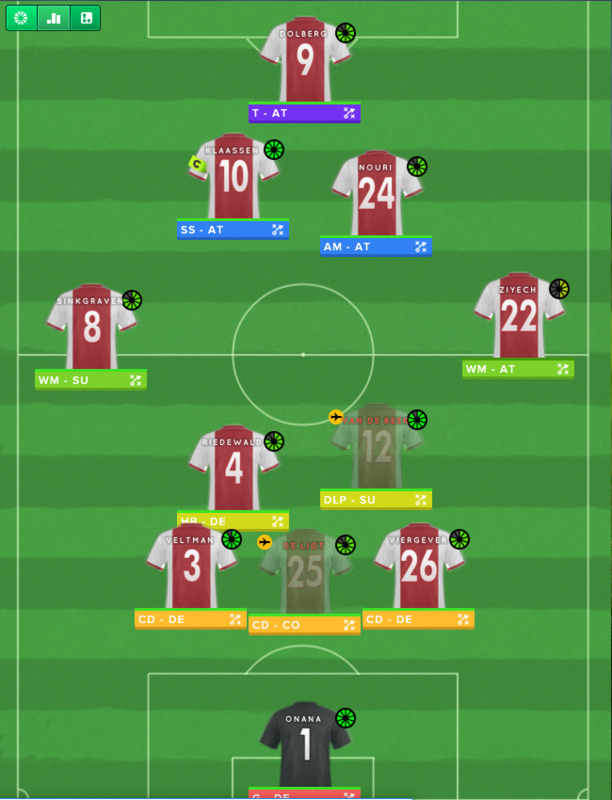 I might consider doing a write-up on this Ajax save due to how well we’ve managed to develop the youngsters there, but that remains to be seen. For now, and on a conclusive note, I believe both this and the previous part show that the fantasista can be of various profiles and can perform various duties in different systems. Apart from assigning the player to the role of a ‘trequartista’ one needs to make sure that makes sense in the design of the tactical system and that the fantasista can offer as much support to his team-mates as he receives it by them. Inter-connectivity and correct distribution of responsibility can make the fantasista a fearsome outlet of goals, assists, key passes and well… creativity.